If you’ve ever been in love you know, the heart rules. 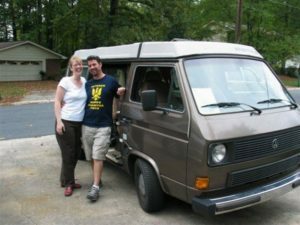 That’s as it is with our 1985 Volkswagon Westfalia. 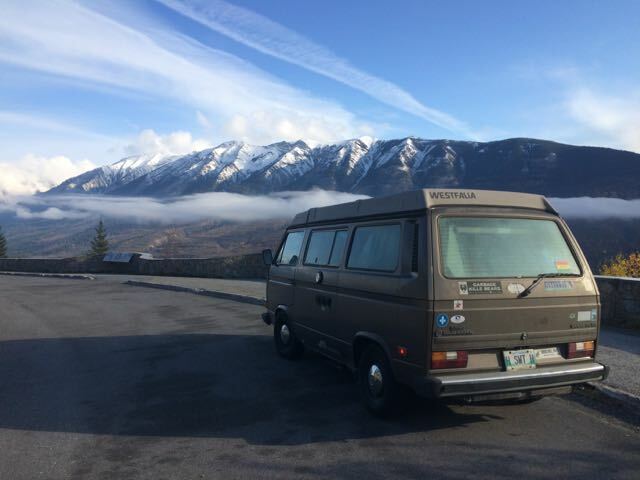 Westie became ours because our original 1976 Westfalia caught on fire and burned on Highway 9 just out of Selkirk, Manitoba. We looked and looked for something more practical than a Westfalia, but when I found Westie on E-Bay, she stole our hearts. Westie was built in Germany in 1985, but for the US market, so its odometer is in miles. We can trace her ancestry back to her original owner because we bought it from their daughter, Ellen. Ellen had spent her youth camping with her family, sleeping on the upper bunk. She inherited Westie when she married Travis, and you can tell he tried to love her. He installed new seats, a new tent for the pop-up, air conditioning, emission controls and a chemical toilet. Still, he wanted something bigger. Ellen shed a tear when we came to pick her up. It had never occurred to me to wire $6000 US to a stranger in another country to buy a vehicle I’d never seen and then take her on a 2500 km road trip as the test ride, but such is love. We bought Westie on October 9, 2007 sight unseen for $6500 US, which converted to $5950 CAD. She was in Marietta Georgia, so we booked a flight and flew off to bring her home. She was so full of extras there was hardly any room for us, like a well-loved pet re-homed with all of her toys. Westie has served us well over the 11 years we’ve adventured in her. She came with 108,000 miles and we’ve added 40,000 more. From coast to coast to coast, she’s taken us. Whether we are scraping ice off the window to watch whales in the morning in Saguenay, Quebec or enlisting a babysitter for her in Thompson, while we make the last leg of a trip to Churchill by train. She’s helped us visit our wandering children many times. We’ve slept in orchards and driveways, truck stops and wilderness. She’s been on more ferries than most people. We’ve lost count of how many music festivals she’s attended. Westie is no spring chicken, and she didn’t always get us aound without trouble, but even her break-downs have been adventure. 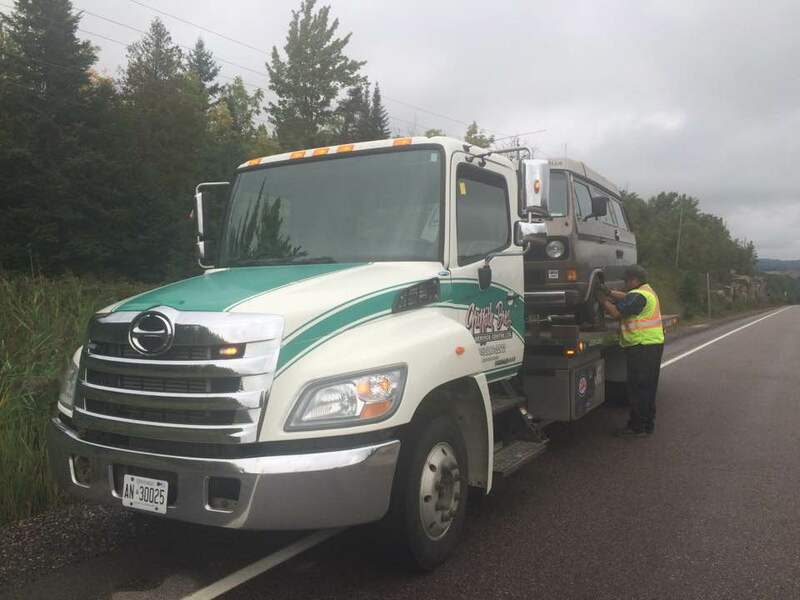 There’s our story of getting stranded on an Ontario highway. We towed her back to North Bay, where we camped at the Volkswagon dealership while waiting for a new rotor from Toronto to arrive. We spent a wonderful evening cycling the beautiful trails of North Bay, camping beside a creek (with awesome WiFi) and enjoying wine and borscht. The mechanic woke us at 8 AM the next morning, and we were back on the road by 8:30. Total bill: $33 – and that included the camping. It was Friday so we ordered the crew at Autohaus Stackelberg a couple of large pizzas for lunch. She balked more than usual last fall on our annual trip to the west coast. She overheated over and over, and sometimes refused to start. 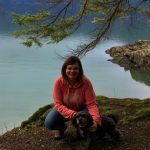 She limped all the way to Vancouver Island and almost back, but on the Trans Canada Highway just east of Winnipeg, she decided to go no further. We called CAA and opened up one of the bottles of wine we’d picked up in the Okanagan. She came home under the cover of darkness on the back of a flatbed. This spring Westie got a new starter and thermostat installed and we declared her “fixed.” She was so happy bombing around close to home, going fishing and to music festivals. When we turned her towards the west coast, though – she put up a fight. We coaxed her as far as Saskatoon, where there was a camper, a replacement for Westie we wanted to look at – and then we turned around. The first time she didn’t get us to our destination. If I were writing on paper, the ink would be smeared with my tears. Yesterday we went to look at a truck, big enough to carry the camper we found in Saskatoon. We went for a test ride and they are working out the price as we speak. The new camper has a bathroom and air conditioning. The new rig will be bigger, better and reliable and so very practical. But love is a funny thing. Last night we slept on it. It looks like whatever Westie needs, Westie is going to get – from us. Here’s hoping for another 40,000 miles with her, practicality be damned. Nice story I almost cried….